Now, for starters I want to reiterate what a terrible idea it is to have work done in your home if/when you are pregnant. Do it before, or after, is my suggestion. Although you won't listen to me, and you know how I know? Because I was told THIS EXACT SAME THING by smart women who went before me. And I stupidly went against their advice. Because what's happened is I have hit week 28 -- the start of the third trimester -- and it's like a switch was flipped. The cankles are on a whole new (painful) level. My back hurts so much it hurts to lift my left leg just to put on a pair of pants. I'm almost certainly waddling. And I'm much too tired to deal with a full week of strangers arriving to my house at the crack of dawn for home improvements. There isn't even a comfortable piece of furniture to sit on because everything's been centered in each room and tarped over. This is quickly becoming a "first world problems" post, isn't it? In any case, they tell me the painting is going to be done today. I have some doubts, but they might pull it off. They've done a great job, much faster and much better than I ever would have been able to do myself. Painting is totally a skill; one I do not possess. So here's a bit of a teaser, just a progress report on where we are right now. You might remember the family room. We had both walls on either side of the fireplace demolished (because it was really just wood paneling with no insulation), insulated, drywalled, and textured, plus a couple of small patch jobs in the room, then painting the whole kit and kaboodle. Here's where we are today. The fireplace has been primered, the walls have been painted. 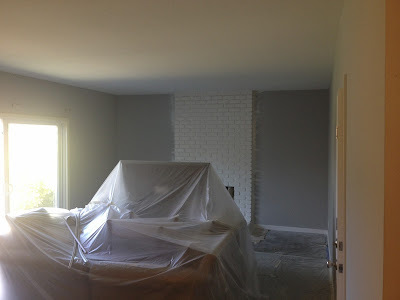 Today they're doing final coats and obviously going to cut in with the gray near the fireplace so it looks nice and tidy. They still have to spackle and paint allllll the baseboard in the whole house, so you can see where I might be a little skeptical. In any case I really love how the gray is turning out, and the blue in the baby's room is totally adorable. And now, a question for you. Originally I'd planned to replace the carpet in the family room with laminate, but after talking it over with the husband, we've decided to put in new carpet so there's a soft floor for babies to crawl around on. 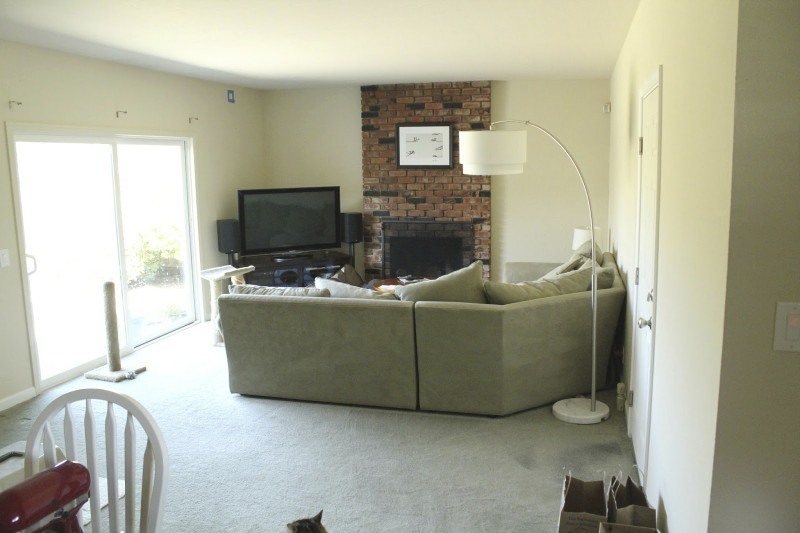 My question is -- what color carpet do you think would look good in there with the gray walls and white fireplace? I don't really want to do white because there WILL be stains, another shade of gray seems like a lot of gray. I think I'm going to have to browse pinterest for a while. I don't think another shade of grey would be bad (I'd go dark, almost charcoal) so long as you add color to the room. Giant bright yellow throw pillows, or red and coral. Big, colorful art on the wall. Yes, I need major color in there. I agree with Serial Monogamist -- go dark grey, and get a really thick mat. I'd also vote for a mottled color -- not just straight grey, something with other shades of grey mixed into it, that way stains won't show. This coming from someone with horrible beige carpet that is covered with stains of who only knows. I agree with Monkey Momma - some sort of mixed color is key. There will be a lot of milk vomit and goldfish crackers on this carpet. The key is to hide both. If there's still a possibility, I'd add another vote to the hard surface category though. It's so much easier to keep clean, especially with the bodily fluid. We have an area rug where the baby plays most of the time so there are soft surfaces but man, wood is where it's at for ease of cleaning. I totally agree about the wood and would do it if I could. The rest of the house is wood, actually. But, some new info has come to light. More on that soon! We have wood floors in our house and our baby did fine with a super large area rug in one room and one of those foam padded puzzle floors in her play area. So don't give up on laminate floors yet, particularly if you have any allergy issues. Otherwise I agree with the specked/flecked/mottled look with blends of different grays and such. I do have allergy issues and I find hardwood so much easier to clean. But now I have actually stumbled across another reason I need carpet -- will blog about it soon. We have light gray walls in our house and the carpet (which was here when we bought it) is sort of white, gray, and brownish speckled. The combo seems to work pretty well. I cannot imagine renovating while pregnant. My husband and I are going to renovate our house next year and we're already joking around about how we might end up divorced. You are brave for taking it on at such a vulnerable time!